The document . . . maintain[s] that leading figures in the British media have deliberately sought powerful positions in order to further the Jewish cause. AMONG London's intellectual elite there are few more glamorous than Michele Renouf, former wife of the late Sir Frank "the Bank" Renouf, the wealthy New Zealand financier. But there is another side to her, which might give some of her admirers pause for thought. She is a vocal supporter of the right of David Irving, the controversial historian, to air his views. 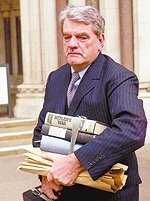 Two years ago Mr Irving was labelled a racist, anti-Semite and falsifier of history by a High Court judge, Mr Irving lost a libel action he brought against American academic Professor Deborah Lipstadt and her publisher, Penguin Books. He sued over being called a "holocaust denier" in her book, Denying The Holocaust. The court ordered him to pay the estimated £2 million costs of Ms Lipstadt and Penguin. Despite the crippling bill, Mr Irving has continued his activities, thanks mainly to the efforts of a well-organised coterie of supporters and the alleged setting up of a company linked to his Danish wife, Bente Hogh, which has kept some funds beyond his creditors. Lady Renouf met Mr Irving during the trial and, ever since, she has been arguing his rights to freedom of speech have been curtailed. Now, an email from Lady Renouf to her friends and fellow campaigners, has been passed to the Evening Standard. In it she encloses a study entitled Jewish Control Of The British Media. The document is a breathtaking work of anti-Semitism, maintaining that leading figures in the British media have deliberately sought powerful positions in order to further the Jewish cause. The author of the 11-page analysis is said to be Thomas Sparks. The Evening Standard has been unable to find any trace of Mr Sparks and, when asked if she could put the paper in touch with him, Lady Renouf declared she had no idea who he was. Mr Sparks's work claims to be "an overview of the almost total Jewish control of the media in Britain at the end of 2001". On page after page, he lists people of influence in the media he claims to be Jewish, often without any explanation except they are Jewish. Bizarrely, he includes "the Jew Rupert Murdoch". For the BBC, Mr Sparks singles out Greg Dyke, the Director-General, who was "appointed by the fanatically multicultural New Labour government". Mr Sparks goes on to say that Mr Dyke "has made the Negress Linda Mitchell Head of Diversity at the BBC", with the job of ensuring the BBC reflects the ethnic-religious make-up of the UK. Still on the BBC, the study sent around by Lady Renouf talks about "the Jew Alan Yentob", who is "a close personal friend of the Jew Michael Green [of Carlton] and of the Jew Michael Grade [of Pinewood-Shepperton studios]. They holidayed together in the Caribbean". Jenny Abramsky, director of BBC Radio and Music, is described as "the Jewess". In a section entitled The Cultural Diversity Network, Mr Sparks maps out how he believes the "Jewish-controlled" broadcasters in Britain are committed "to the intense, systematic promotion of a permanent transformation of Britain into a multiracial, multicultural Britain", He maintains "the Jews have been using their control of the media to transform Britain for decades", and the ultimate aim is "Kosher TV". The belief that Rupert Murdoch is a Jew is endemic among right- wingers, and they refuse to believe that he is not (he is not, though some of his relatives are; and he is one of my heroes for what he did to the beautifully-coiffed SOGAT union-boss, now Lady Brenda, who thought she had the Fleet-street press barons eating out of her union's hand, then got from Mr Murdoch what can only be called an almighty Wapping. As for this article itself, it reminds me of an old Daily Mirror front-page headline, perhaps thirty years ago: "WE NAIL THIS FILTHY PRINCE PHILIP LIE", it ran -- ostensibly demolishing some vicious untruth about the Queen's consort, while really seeking a backhanded way of regurgitating the facts of the story itself. The newspaper journalists like Mr Blackhurst are as familiar with the layout of the proverbial vineyard in which they labour as their most noisome fascist opponents: the grim fact is indeed that much of the British media are directly, or indirectly (through advertising pressures), at the beck and call of individuals who are only recently British, if at all. Note that Blackhurst makes no attempt to deny that the others named are Jewish or (in the case of the no doubt lovely Ms. Mitchell) positive-discrimination beneficiaries, if I may put her colour that discreetly: it sounds better than "the fall-out and flotsam of political tokenism." The writers whine and whinge, but they cannot do anything about it themselves; so they use an episode like this e-mail to blurt out their own bleak realisation of the fact, to get it off their hollow, hairless chests, just as the Daily Mirror did all those years ago. "The journaille" -- that is the collective noun that Dr Joseph Goebbels, the Nazi propaganda- meister, invented for the professional journalists. It is a name that they just can't shake off: they bleat and cringe, hovering only a few microns above the social stratum of the courtroom lawyers that they loath and fear. Both of them come, in my estimation, some way below the slime through which slither the cockroaches which no doubt infest the space between the floorboards and the lino which peels and rots away beneath the twenty-five year- old and leaking dishwasher which still does duty in my kitchen. Newspapers are not spared either. Mr Sparks asserts that the endgame of News International, controlled by "the Jew Rupert Murdoch" is "Kosher News", At the Telegraph Group, Mr Sparks declares that "Conrad Black is a raving Zionist" while his wife, the columnist Barbara Amiel, is billed as 'the Jewess". intensely feeding their propaganda and example to almost everyone in Britain." They are, he claims, "uniformly, deliberately, systematically constantly and intensely promoting both the transformation and permanent destruction of Britain into a multiracial, multicultural state and also the interests of the so-called state of Israel". He ends: "That is treachery, treason, of a terrible magnitude. We must break the Jewish yoke if our race is to survive." SO, who exactly is Lady Renouf? Now in her early fifties, she has led a colourful and dramatic life. Born Michele Mainwaring, she married Sir Frank in January 1991 when he was 72 and she was 44. She claimed to the multimillionaire banker that she was Countess Griaznoff, ex-wife of a Russian nobleman and stated on the marriage certificate that her father was dead. When he took his new bombshell wife on a six-week honeymoon to Australia, Sir Frank learned the truth: her father, Arthur, was a retired truck driver and very much alive, From his home in New South Wales, Arthur rubbished his daughter's aristocratic pretensions. She was previously married to psychiatrist Daniel Griaznoff by whom she had two daughters. At the reception, Sir Frank had said "her title is Russian". When he learned the truth, the stunned financier parted company with his wife immediately and they divorced in 1996. Since then she has continued to call herself Lady Renouf and has become closely identified with Mr Irving's cause. LAST year, Lady Renouf provoked an almighty row at the Reform by pressing for Mr Irving's freedom to visit the club. She also invited him to attend a meeting of another liberal organisation, the European Atlantic Group, a move that led to another public falling out and her resignation from the Ladies Committee of the group. Asked yesterday whether she agreed with the sentiments in Mr Sparks's study, she said, "I think it's worth looking into." Factual errors, including calling Rupert Murdoch a Jew, were dismissed. She said: "What interests me is the overall analysis of a democratic situation in which the media can condition us without any recourse to criticism." Asked whether she seriously believed a "Jewish mafia" was controlling our lives, Lady Renouf answered: "We must look into who has a veto on the media, whoever has a veto on us must be examined." She added that it was acceptable to criticise the Mafia and to still like Italians, "but I can't criticise Jews without being Semitic". She said the document passed to the Standard was an "email that came to me without a covering note". She added that Mr Sparks was not Mr Irving, saying: "He is not interested in religion, not at all." It was not beyond the realms of possibility, argued Lady Renouf, that Mr Sparks was himself Jewish, "because they like to promote the concept of anti-Semitism". But she could shed no light on the author's identity. She forwarded it to a circle of people "who are interested in this subject". One of them, she said, broke a confidence by sending it to the Standard. Lady Renouf maintained that describing Ms Mitchell as a "Negress" reflected "the author's interest in race". She doubted Ms Mitchell would be offended by use of the term. A spokeswoman for Ms Mitchell and the BBC said the Corporation "would not dream of commenting on this material".